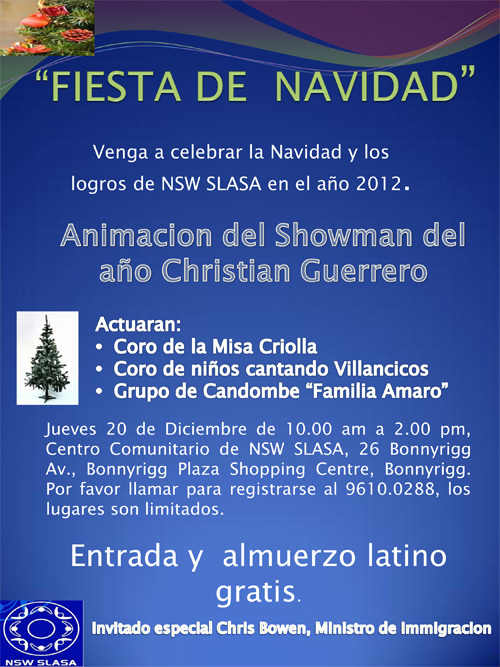 Coro Austral was a guest performer at NSW SLASA's Christmas celebrations at Bonnyrigg, where we were billed as Coro de la Misa Criolla in reference to our sold-out performance the month before. Our reception was as warm as the day was hot. 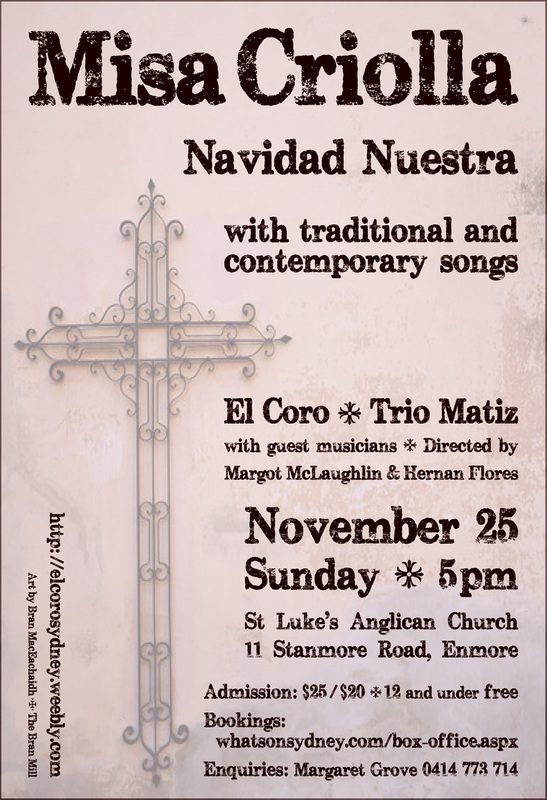 Our performance included Javier Busto's Esta Tierra, Carlos Guastavino's En los surcos del amor, Francisco Guerrero's 16th century Christmas song A un niño llorando al hielo, and a quartet performance of Gaspar Fernández's Xicochi xicochi, the 17th century Christmas motet from Mexico written largely in the Nahuatl language. We closed with the popular Noche de Paz, which English speakers know as Silent Night, in a wonderful arrangement by courtesy of the awesomely talented Australian organist and composer David Drury. We were joined by our friend Hernan Flores, the Chilean singer and songwriter, who performed some of his own pieces to great acclaim. Our last big concert of 2012 featured two much-loved pieces by the late Argentinian composer Ariel Ramírez: the Misa Criolla and the Christmas cycle Navidad Nuestra. The venue was St Luke's Anglican Church at Enmore, and the concert was just shy of being completely sold out. The program opened with a bracket from El Coro that included Carlos Guastavino's En los surcos del amor and Se equivocó la paloma, Beatriz Corona's Corazón coraza, Alfonsina y el mar by Ariel Ramírez, Ave Maria by Javier Busto and A un niño llorando al hielo by Francisco Guerrero. 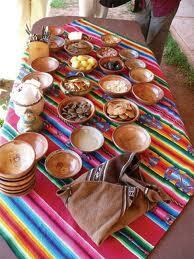 Navidad Nuestra followed. After a cordial supper, Trio Matiz (Hernan Flores, Janis Carter and Imogen Granwal) opened the second half with songs of passion and social justice, followed by the ensemble performance of the Misa Criolla. The choir was augmented for the performance by musicians and vocalists Hernan Flores (vocals, guitar, bombo, djembe), Janis Carter (vocals), Imogen Granwal (cello), Ricky Vargas (guitar), Manuel Garay (charango, zampoñas, percussion) and Liane Sadler (flute). The conductor was Margot McLaughlin. 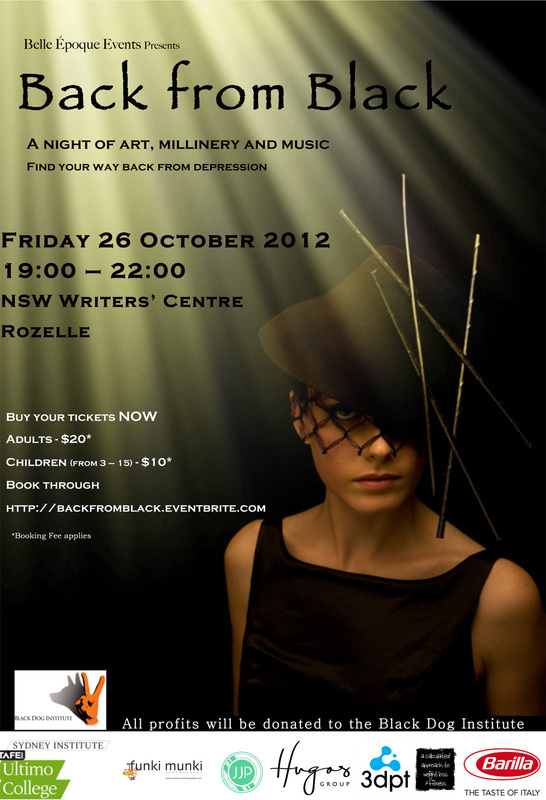 A fund- and awareness-raising event for The Black Dog Institute held at the NSW Writer's Centre, intended to represent and educate about the various stages of recovery from the teeth of depression. It was a multimedia evening, incorporating art, millinery and music. We were asked to choose and perform a bracket of songs of lament and loss, representing moments of blackest despair. We opened our part of the evening with the funerary lament Triste España sin ventura, written by Juan del Enzina in 1504 for the untimely death of Prince John of Aragon and Castille, heir to the throne of Spain. 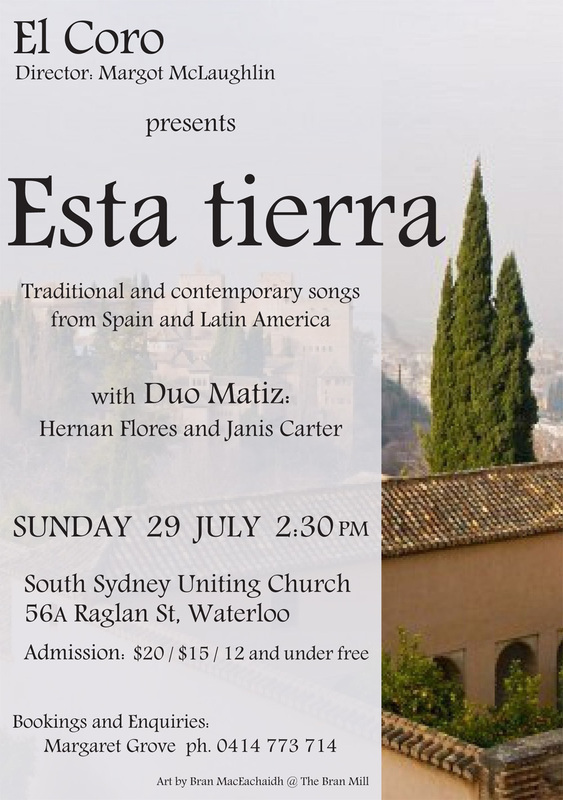 This was followed by Manchai puito, a traditional piece from Argentina about star-crossed lovers, Miguel Matamoros' Juramento (A Promise), Beatriz Corona's Corazón coraza (The Shielded Heart), Carlos Guastavino's En los surcos del amor and Se equivocó la paloma (songs of the travails of love), Ariel Ramírez' Alfonsina y el mar (a lament for revered Argentinian poet Alfonsina Storni who, in the grip of both depression and breast cancer, walked into the sea) and, finally, Javier Busto's Esta Tierra, a paean to his Basque homeland and a song of gentle surrender. We were delighted to be part of the coveted Saturday Evening session at this year's Festival, appearing in the same bracket as the Café of the Gate of Salvation, the Riverland Harmony Chorus and the Sydney Gay & Lesbian Choir. Our own part of the evening opened with an evocative Sephardic piece from Turkey, Par’ó era estrellero, telling the story of Moses and the Pharaoh. What to follow that with but two versions of the Ave Maria, by Tomas Luis de Victoria and Hector Villa Lobos, then ¡Ay luna que reluces!, a Renaissance-era ode to the Moon, a favourite in Javier Busto's Esta Tierra, and a progressive jazz piece El Progreso Honduras by Elliot Z. Levine of The Western Wind. Our performance moved to a close with Manchai puito, a wistful song of lost love from Argentina, and then — a break from usual style for us! — Bajo el mar, the Spanish version of Under the sea from Disney's The Little Mermaid. We closed with the gentle Nahuatl lullaby from Mexico, Xicochi xicochi. Our first large concert of the year, held at the South Sydney Uniting Church, our rehearsal venue for the previous two years. We were joined for the afternoon by our friends Duo Matiz (Hernan Flores and Janis Carter), and were pleased to host a very full house. It was also a very full programme, broken into three themed brackets. Sacred Songs featured Par’ó era estrellero, the Sephardic telling of Moses and the Pharaoh, the Ave Maria of Tomas Luis de Victoria, Pablo Fernandez Badillo's Alabanza, a Puerto Rican hymn to nature as a sacred space, and the tear-stirring Ave Maria of Hector Villa-Lobos. Songs of Time & Place opened with the Renaissance ode to the constant Moon, ¡Ay luna que reluces!, then moved to Javier Busto's love song to the Basque countryside, Esta Tierra, Elliot Z. Levine's El Progreso Honduras, an arrangement of a work by Puerto Rican poet Sheila Maldonado, and closed with Gaspar Fernández' gentle Mexican lullaby, Xicochi xicochi. And finally, Songs of Love opened with the Argentinian Manchai puito, Carlos Guastavino's lingering En los surcos del amor and Se equivocó la paloma, Miguel Matamoros' Juramento, and then went upbeat with Bobby Capo's popular Cuban bolero Piel canela. Finally, a traditional dance piece from Colombia and/or Panama (there's some dispute! ), Bullerengue, brought the afternoon to a close with claps and stamping feet. A show'n'tell session organised by James Paul. 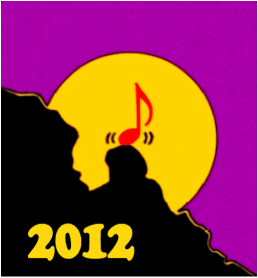 Other choirs attending were the Sydney Trade Union Choir (also conducted by Margot McLaughlin), Christina Mimmocchi's Darlo after Dark, and James Paul's Stairwell to Heaven and The Overcommitments. A great afternoon where we each provided the others' audiences at St John's Hall in Glebe. Our own something-to-share included some then-new pieces for us that have since taken a firm place in our regular repertoire. We sang the Sephardic Par'ó era estrellero, the Renaissance ¡Ay luna que reluces!, the Basque Javier Busto's Esta Tierra, the Brazilian Villa-Lobos' Ave Maria, the Argentinian Manchai puito, the Puerto Rican/Brooklyn El Progreso Honduras, and the Colombian (or perhaps Panamanian!) Bullerengue.